Golden Globe Award winner Sean Penn is an American Actor born on 17 August 1960 when Scorpio zodiac sign was rising in vedic astrology horoscope. The ladies man Sean Penn divorced from Robin Wright in July 2010 and now there are rumors about a romantic relationship being developed between Sean Penn and Scarlett Johansson. Sean Penn and Robin Wright were together for almost twenty years. After the divorce, fifty plus Sean Penn expressed his profound grief over not being able to raise his children anymore. 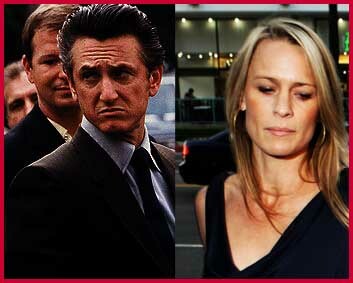 It was after Sean Penn divorce from Madonna in 1989, that Penn began a relationship with Robin Wright. And, the couple was blessed with a daughter (Dylan Frances 1991) and a son (Hopper Jack 1993) before actually getting married to each other in 1996. Rumors about sprouting of a relationship between Sean Penn and Charlize Theron are also in the air. Sean Penn acting career started in 1974 with a brief appearance on Television and by 1995 Penn emerged as a high-flying actor after achieving the best actor award in 1995 for his role in “Dead Man Walking”. Thereafter, Sean Penn portrayed his roles with highest excellence in many movies. May it be the comic role of a egotistical jazz guitarist in “Sweet and Lowdown (1999)”, or portraying a mentally challenged father in “I am Sam” in 2001. Sean Penn grabbed Academy Award of best leading actor for his performance as Jimmy Markum in, “Mystic River (2003)”. In 2008 Sean Penn received his fifth nomination and second Academy Award for depicting the role of ‘Harvey Milk’- a gay activist and politician- in the movie ‘Milk (2008)’. And, when such enormously talented and successful person has to suffer on account of getting separated from his loved ones and that too after such a long and intense relationship of around 20 years; the question of ‘why?’ is quite obvious. After all, Sean Penn is also a human being who needs to be caressed and loved. Alike every other human being on Earth, he would also have wanted to live a happy married life. We all think and aspire for professional and financial success, simply because we want to offer our best in our relationships in terms of money, comforts and luxury. But such incidents of life render every success meaningless. What will you do with so much success and wealth when you have no-one to exchange love and emotions? Almost every person needs a companion with whom he/she can live and find meaning and purpose of his/her life. In Sean Penn’s life also the matter is nothing different. Both Sean Penn and Robin Wright were together since last twenty years; and during such a long period of time – there would have been many ups and downs in their relationship as it happens in almost every relationship. But there has to be something odd, which resulted in Sean Penn divorce. And, over here I am trying to find out that “Something” on the basis of vedic astrology readings. I tell you my friend; these planets do not spare anyone and just play their roles as destined via vedic astrology. When the time occurs, the native concerned starts thinking and behaving in accordance with the destined decisions of the planets in his or her horoscope. In Sean Penn vedic astrology horoscope the ascendant lord Mars is placed in seventh house and that makes him quite dominant in his relationships. The second house is occupied by Jupiter and Saturn. Both these planets are retrograde and vedic astrology readings of retrograde planets give very strong and prominent results. For Scorpio ascendant, Saturn is a negative planet as per vedic astrology reading and its placement in second house along with Jupiter is not desirable. Moreso, when Jupiter is also lord of second house in Sean Penn vedic astrology horoscope. The second house is related with wealth, status and family in vedic astrology readings. Saturn, as a Dhatu (Metal element) planet in vedic astrology, may not cause much harm to financial matters for as far as other aspects of second house are concerned, this Saturn+ Jupiter conjunction may cause all sorts of problems in the family and social status of a person. The lord of ninth house i.e. the Moon is placed in eighth house and hence the ninth house becomes weak. Therefore, Sean Penn may not have support of luck during unfriendly situations. It is because of this vedic astrology reason that Sean Penn is quite unpredictable and known for outbursts of temple resulting into attacks on people besides drinking and driving. Sean Penn first wedding with Madonna turned into a nightmare by the intrusion of the Press. As per his vedic astrology birth chart, Sean Penn wedded Madonna on 16 August 1985 when he was under main-period of Jupiter and sub-period of Rahu (North Node). 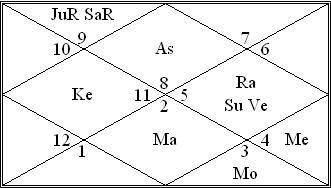 As we have already seen that Jupiter is under affliction of Saturn in second house itself; the Rahu (North Node) is placed in tenth house along with the Sun and Venus. Vedic astrology readings for conjunction of Rahu and Venus in Scorpio ascendant are not auspicious. While the conjunction of Rahu and Sun is quite suitable for success in professional matters. Therefore, the conjunction of Rahu(North Node) + Sun + Venus has given mixed results . The effect is good for professional matters while for relationships the outcome is bad, as evident from vedic astrology reading. Vedic astrology readings of Sean Penn horoscope suggest dominant, possessive and quite impulsive nature. And, when the planetary period is indicating troubles, he also lacks support of luck in his favor. Main period of Mercury and sub-period of Venus started from April 2009 and it will remain operational till January 2012. Mercury, as lord of eighth house, is not a friendly planet for Sean Penn and obstructs his life through unfavorable luck. And, Venus weakness has already been discussed. Therefore, during the main-period of Mercury and sub-period of Venus, Sean Penn is destined to face the dark-side of his fate in terms of matters related with Mercury and Venus. As per vedic astrology readings, the seventh house of a horoscope is basically related with spouse and marriage; and Venus is also lord of Seventh house. Therefore, the Mercury obstructed and destroyed the marital significations of Sean Penn during the sub-period of relevant but weak planet i.e. Venus. The Venus also rules over twelfth house of Sean Penn horoscope. As per vedic astrology reading, the twelfth house is related with expenses, losses, pain, suffering and separation. Therefore, during the sub-period of Venus, Sean Penn have also taken a lot of pain in doing the good work for thousands of people got badly affected earthquake in Haiti. And, very recently, Sean Penn honored for his contribution and help in Haiti. Will Sean Penn be entering into fresh relationships or will he try to make up his mind to lead his life alone? Well, on the basis of vedic astrology readings, the presence of Mars in seventh house may not allow Sean Penn to remain away from new relationships. However, he should not make any haste in getting involved seriously. Therefore, Sean Penn may like to take another chance in his life to see if he is still destined to be loved and cared. Vedic astrology readings suggest that the chances of Sean Penn getting involved in another serious relationship are quite strong during second half of this year 2011. This is more so because vedic astrology readings are indicating that during the next year 2012 – Sean Penn is destined to enjoy one of the best periods of his life.